While I usually highlight the financial benefits of starting a side hustle, today I want to talk about the bigger lessons – ones that can help you grow. These may not see like big projects, but I’ve picked up some great lessons. In these two months, I picked up some lessons. Side hustles can be a wonderful way to expand your network. 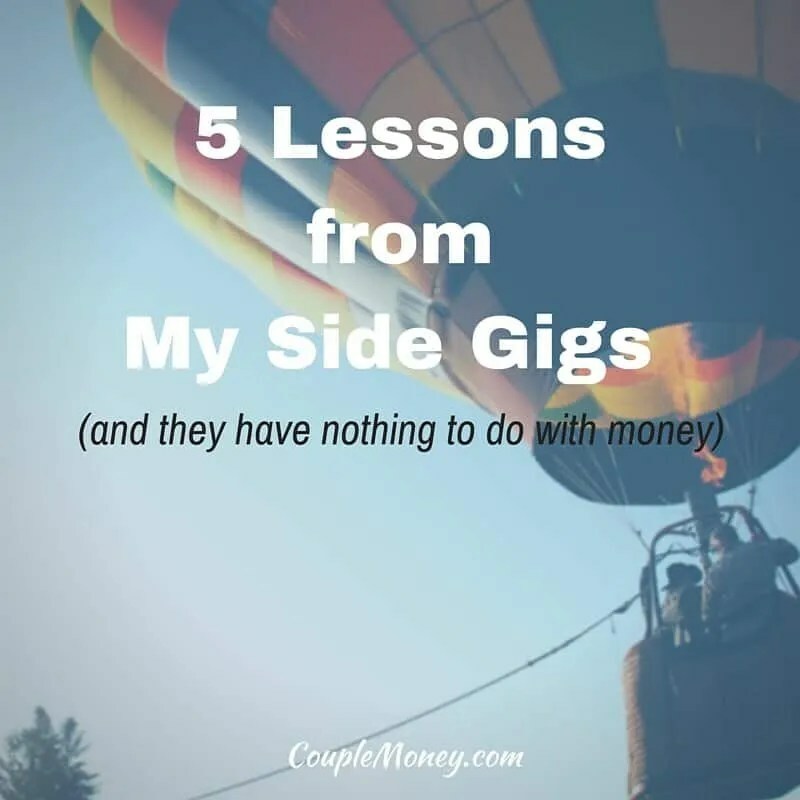 I hadn’t expected how easy it was to meet new and interesting people through side gigs. What makes it better is that there are numerous ways meeting can intersect. I had a podcast interview with Nick Loper and because of my side gigs, we had even more to talk about. The conversation and podcast were enriched because we had another connection. Side hustles gives you an excuse you to learn new skills. Since I signed up for Fiverr and offered my skills to consult on podcasts, I’ve sharpened what I know. I dissected and analyzed Alex Blumberg’s class on Power Your Podcast with Storytelling. Just preparing for the side gigs has pushed me to improve my own podcast. Side hustles give you freedom to fail. When you spread out your income streams you can feel a little more confident with experimenting. With the Fiverr Hustle I tried out different gigs, some of them outside my comfort zone. Sides hustles means wearing different hats. You are the marketing department, the project manager, and accounting. As you expand you can outsource some, but when you work for yourself you tend to stretch yourself with responsibilities. Side hustles are still jobs. Even fun and rewarding as they can be, you’re still working. You’re expected to deliver a good or service to a client. Treat everyone with respect and give your best. With the competition over for me anyways, I’ve decided to re-evaluate my gigs. Based on my schedule for the next few months I’m dropping the editing gig. I’m launching a new blog in less than a month so I need to devote time to getting that ready. I’ll keep the podcast consultation and the intro gigs up. Getting back to expanding my network, I feel like these opportunities will allow me to connect with other podcasters. As we get into 2016 I will work at building these gigs into income streams. So all in all, I call this challenge a success. So if you’re looking for a way to earn some extra money and expand your skill set, tryout Fiverr. How many of you have a side gig to earn extra money? How did you get into it? Are you planning on keeping it? Disclaimer: This post is sponsored by Fiverr.com in cooperation with Kasai Media. While I have been compensated for participating in this challenge, all opinions expressed are my own. I really need to head over there and see if I can dip my toes in some stuff. A little side income would be nice and I know I have strengths in a few areas that I could likely leverage quite easily. But seriously, I think Fiverr a low barrier way try some things out. There is a huge community there and a nice market to start with. This is an idea I’ve been playing around with. It hasn’t been a pressing issue because I’ve felt like we’re on track with our goals and the money I make from the full-time gig. Of course, a little extra wouldn’t hurt and would help us be more aggressive with the goals. The trick for me, though, is time. Being married and having two young children seems to put free time at a premium. I’m afraid I’d fall asleep mid-hustle! Hahaha, I’m with you – we have a four year old and a 10 months old so free time is gold!